Gallia Academy senior Allie Young snags a throw at first base during Thursday night’s OVC softball contest against Coal Grove in Centenary, Ohio. CENTENARY, Ohio — The flood waters have resided, but the Blue Angels still took a Noah’s Ark approach. 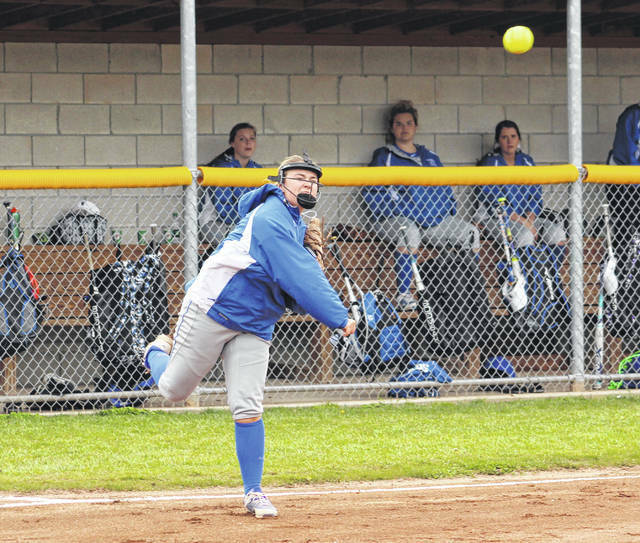 The Gallia Academy softball team scored two runs apiece in the first, third and fifth frames while earning a tie for first place in the Ohio Valley Conference standings on Thursday night with a 6-2 victory over visiting Coal Grove at the Eastman Athletic Complex in Gallia County. The Blue Angels (13-2, 9-2 OVC) never trailed in the contest as the hosts built a 4-0 cushion through three complete, but the Lady Hornets (9-2 OVC) — who managed only one baserunner in their first 11 at-bats — started finding some life in the top half of the fourth. With one away, Kasey Murphy turned a hit-by-pitch into a double with a stolen base, then a pair of wild pitches allowed the Red and Black to close to within 4-1. 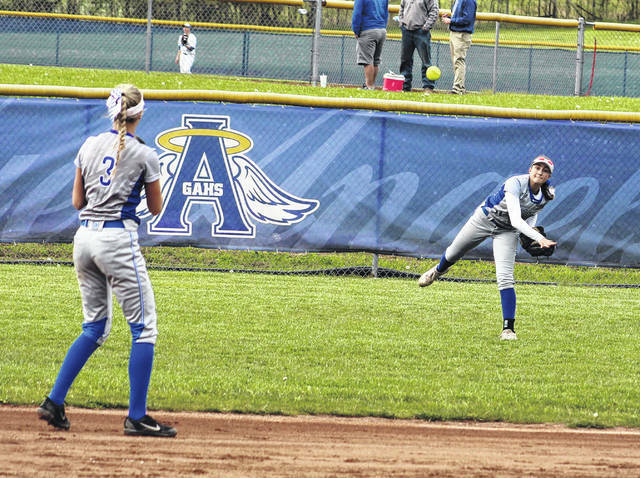 The Blue Angels, however, packed on some insurance in the home half of the fifth as Allie Young delivered a two-out infield single that ultimately allowed both Bailey Meadows and Chasity Adams to come home from second and third — giving the Blue and White their largest lead at 6-1. Lauren Meyer singled with one out in the top of the seventh to plate Addi Dillow, allowing CGHS to close to within 6-2. A pop-up and a fielder’s choice followed to wrap up the four-run triumph. 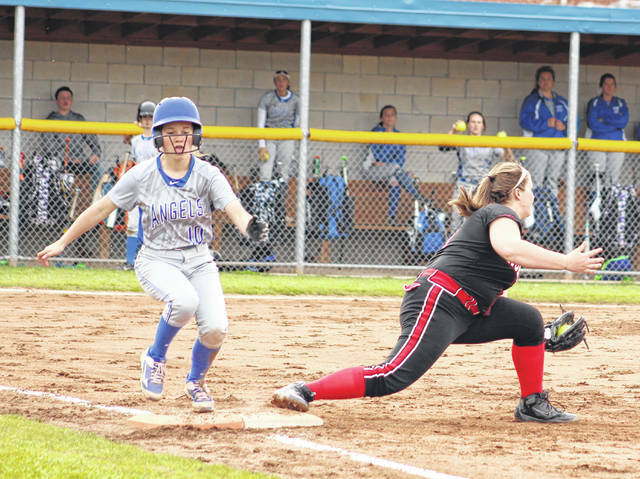 Gallia Academy built a two-run cushion in the first as Ryelee Sipple doubled in Bailey Young with the eventual-game winning run, then Sipple came around to score on a one-out single by Bailey Meadows. Meadows gave the hosts a 3-0 cushion in the bottom of the third with a single that plated Sipple, then Alex Barnes scored on a sacrifice bunt that made it a four-run contest. 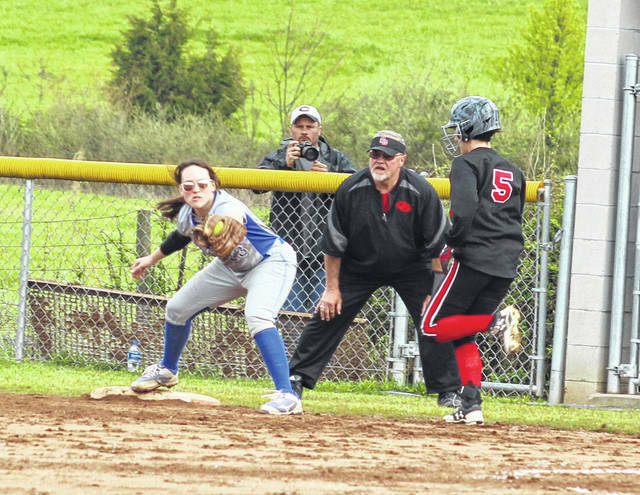 All but two players in Gallia Academy’s batting order accounted for at least one run, one hit or one RBI, making it a collective effort in picking up this important victory. The Blue Angels will also travel to Coal Grove in the rematch next Tuesday. Given the relevance of this OVC contest, GAHS coach Scott Stanley was pleased with the way things turned out. He also believes it provides a little momentum moving forward. “I think our baserunning was the difference tonight. We were smart on the base paths and took advantage of some situations when they presented themselves,” Stanley said. “This one was a big team effort, and it’s good for the girls because they know they can count on each other. The Blue Angels outhit the guests by a 9-5 overall margin and also committed only two of the five errors in the contest. Both teams stranded seven runners on base. Hunter Copley was the winning pitcher of record after allowing one earned run, five hits and one walk over seven innings while striking out seven. Murphy took the loss after surrendering six earned runs and 10 hits over six frames while fanning five. Meadows led the hosts with three hits, followed by Sipple, Barnes and Allie Young with two safeties apiece. Bailey Young also had a hit in the victory. Meadows and Allie Young both drove in two RBIs each, while Sipple led the Blue Angels with two runs scored. Meyer, Gracie Riley, Lauren Crum, McKenzie Moore and Delaney Napier had a hit each for Coal Grove. Meyer drove in the Lady Hornets’ lone RBI. Gallia Academy traveled to Athens on Saturday for a doubleheader and returns to action Monday when it hosts Fairland in an OVC contest at 5 p.m.